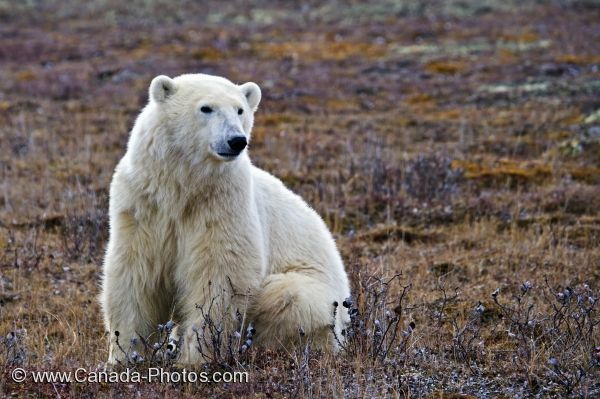 A Polar Bear posing for our camera on the barren tundra in the Churchill Wildlife Management Area in Manitoba, Canada. The tundra is still very dry and barren in the Churchill Wildlife Management Area near the Hudson Bay in Churchill, Manitoba as this adult polar bear sits very nicely while we take his picture. These animals do not make posing part of their daily task, it is just a natural way for the Polar Bear to sit while scanning his surroundings. Picture of a Polar Bear posing as he sits on the barren tundra of the Churchill Wildlife Management Area in Manitoba.